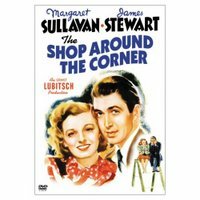 The next movie I watched was The Shop Around the Corner from 1940 staring Jimmy Stewart and Margaret Sullivan. They are co-workers who can't stand each other. The only problem is that they are also anonymous pen pals who are falling in love. This movie was eventually remade as You've Got Mail. This is a very sweet love story that actually stands the test of time. Jimmy Stewart shines as the leading man - the perpetual nice guy.